A new editorial from Capitol Broadcasting Company takes North Carolina legislators to task over teacher pay, part of a long-running series of criticisms against Republican leaders in the N.C. General Assembly. Teacher pay has been on the rise in recent years, but the state’s pay plunged from 2009 to 2018 when adjusted for inflation. North Carolina’s legislative leaders have come up with lots of ways to say they’re paying public school teachers well. With the help of Republican-oriented “think tanks” they point to questionable claims of accelerated pay raises, cost-of-living differentials and use local supplements – particularly from a handful of the state’s urban school districts – to paint a rosier pay picture. 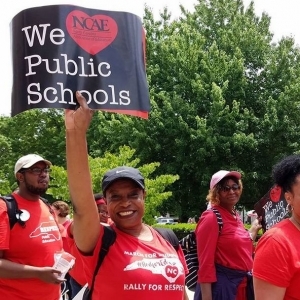 The unfortunate reality is that North Carolina has become something of a national punching bag for teacher pay. Earlier this month the New York Times, in a story titled ”The Second Shift: What teachers are doing to pay their bills,” highlighted an Iredell County middle school teacher (who reached peak pay and has been in the classroom for 19 years) forced to work a second job to make ends meet. A recent report from the Economic Policy Institute showed the gap between wages for teachers and other college graduates is at the highest level ever. The pay differential – the institute calls the difference between what teachers are paid in relation to comparable workers as the “teacher pay penalty.” North Carolina ranks 49th – only Arizona is worse. North Carolina teachers earn 35.5 cents on the dollar compared to what other college graduates earn. Overall public school education funding still lags. “In constant dollars, North Carolina’s spending per student peaked at $9,952 in 2007-08, ranking 40th in the nation. State support per student continued to slide to $8,784 in 2012-13, when North Carolina ranked 46th. As North Carolina’s population continued to grow, state legislators made incremental increases until spending per student reached an estimated $9,528 in 2017-18, ranking 39th. But spending per student still remained $424 less than pre-recession levels in 2017-18, after adjusting for inflation,” according to a recent analysis from the Higher Education Works Foundation. This is not a record that represents a commitment to quality public schools and respect for the professionalism teachers bring to the classroom.